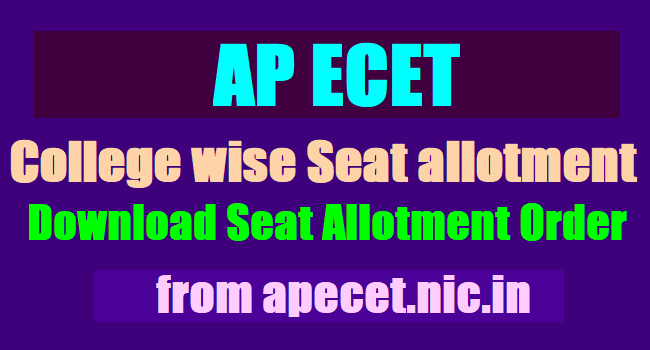 AP ECET 2018 College wise Seat allotment to be released at apecet.nic.in: AP ECET seat allotment 2018 result to be declared, download at apecet.nic.in: AP ECET 2018 College Wise Allotment Results/Provisional Allotment List for admission into University and Private Engineering Colleges and Pharmacy Colleges. The AP State Council of Higher Education (AP SCHE) will released the college-wise Seat allotment details for AP ECET 2018. Candidates who have appeared for and cleared the exam can check their results on the official website of the Council. JNTUA has issued the AP ECET 2017 notification on 02nd February, 2017 and the University invited online applications from the eligible candidates from 24-02-2017 to 23-03-2017 through online mode at its web portal apecet.org. Students who were applied for this stream, they were appeared the engineering common entrance test 2017 which was conducted on 03-05-2017 by 10 AM to 1 PM. The results of entrance test were released on 08-05-2017 and appeared Candidates are checked their results from ap ecet web portal apecet.nic.in. The Qualified candidates of APECET-2017 (Diploma holders of all branches including Pharmacy & B.Sc. Maths) were exercised their web options from 29-06-2017 to 02-07-2017. ADMISSIONS INTO ENGINEERING & PHARMACY (APECET - 2017): APSCHE will announce the seat allotment result of AP ECET 2017 on the official website – apecet.nic.in. Engineering Common Entrance Test (ECET) is conducted by Jawaharlal Nehru Technological University Hyderabad on behalf of TSCHE.